Groundradar conducted their first nickel laterite survey in Indonesia 21 years ago using now-obsolete equipment. Although the results were excellent, the survey required over one month to complete 50 km, with survey cut lines 5 m wide and perfectly clean. Today, UltraGPR can be used to survey the same distance in a few days with only a thin walking trail required. The demand for UltraGPR in nickel laterite exploration in Sulawesi Island has risen dramatically in the last year, with there now being a back log of projects to be conducted by Groundradar’s Indonesian team. 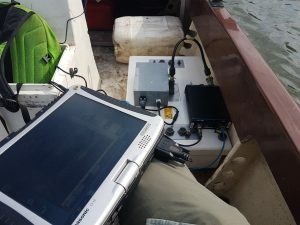 Groundradar visited Zambia to conduct a series of UltraGPR surveys over the Zambezi River in relation to a proposed hydroelectric project. 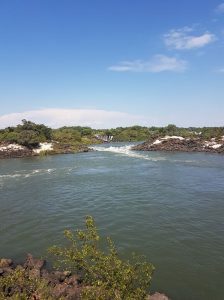 The remote site presented significant logistical challenges, including rapids, numerous hippopotamuses, submerged rocks, etc. Groundradar successfully conducted an extended trial survey of radar technology over a series of heavy mineral sand deposits in Tanzania. Penetration to well over 60 m was achieved in the clay-rich sands, with the ability to map the base of sands, as well as thin induration zones near the surface. In some areas, it appears that the radar was able to map the sand layer more consistently than drilling. 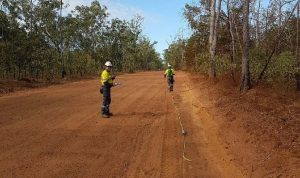 Groundradar and its Australian (Core Geophysics) and Indonesian (Danmar ExplorIndo) partners have conducted a series of large surveys for alluvial paleochannels in the vicinity of RioTinto’s Argyle diamond mine in Western Australia. The surveys were successful in imaging paleochannels as well as lenses of thick gravels.